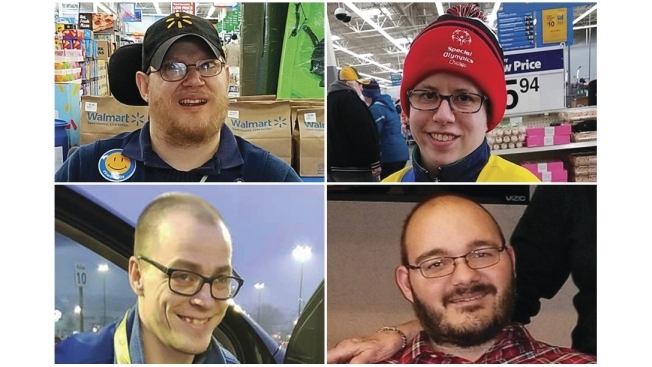 This combination of images shows Walmart greeters, clockwise from top left: John Combs in Vancouver, Wash., Ashley Powell in Galena, Ill., Mitchell Hartzell in Hazel Green, Ala., and Adam Catlin in Selinsgrove, Pa. They are among disabled Walmart greeters threatened with job loss as Walmart transforms the greeter position into one that’s more physically demanding. After more than a week of backlash, Walmart is pledging to make "every effort" to find other roles for disabled workers who'd accused the retailer of targeting them as it prepares to eliminate the "people greeter" job at 1,000 stores. Greg Foran, president and CEO of Walmart's U.S. stores, said in a memo to store managers Thursday night that "we are taking some specific steps to support" greeters with disabilities. Walmart released the memo publicly. Walmart told greeters around the country last week that their positions were being eliminated in late April in favor of an expanded "customer host" role that involves not only welcoming customers, but helping with returns, checking receipts to help prevent shoplifting and keeping the front of the store clean. The position requires hosts to be able to lift heavy weights, climb ladders and do other tasks. People with disabilities who have traditionally filled the greeter job at many stores accused Walmart of acting heartlessly. Outraged customers and others started online petitions, formed Facebook support groups and called and emailed Walmart corporate to register their displeasure. Acknowledging the change had "created some conversation," Foran wrote: "Let me be clear: If any associate in this unique situation wants to continue working at Walmart, we should make every effort to make that happen." Walmart initially told greeters they would have the customary 60 days to land other jobs at the company. Amid the uproar, the company has extended the deadline indefinitely for greeters with disabilities. "In terms of the associates with disabilities who are transitioning out of the People Greeter position, we recognize these people face a unique situation. And because not all disabilities are the same, each case requires a thoughtful solution," Foran wrote. "For that reason, we are looking into each one on an individual basis with the goal of offering appropriate accommodations that will enable these associates to continue in other roles with their store." Walmart said it has already started making job offers to greeters with disabilities, with at least one, Jay Melton, who works at the store in Marion, North Carolina, accepting so far. Melton, whose family had spoken out about his impending job loss, will work at self-checkout, Walmart said. "Jay has been a part of our store for the last 17 years and is well known throughout our community. Please help us congratulate Jay on his new position!" the Marion Walmart said on its Facebook page.